Brand equity: ESPN Star Sports’ Manu Sawhney says BCCI should tie up with his company to be successful. As the Indian cricket team defeated Australia by eight runs on Monday evening, Manu Sawhney wasn’t watching his competitor network but was strategizing how he might replace it. Sawhney, former chief of the Indian operations, was in town for the first time since being named ESPN Star Sports’ managing director last month. With ESPN Star Sports’ competitor Neo Sports having rights to all cricket played in India and organized by the local cricket board, Sawhney said he planned to appeal to the Board of Control for Cricket in India (BCCI) to consider ESPN a partner as it rides the return of the euphoria surrounding the game. He said the upcoming Indian Premier League represents the perfect opportunity. “For any sport to develop one has to nurture it," he said. 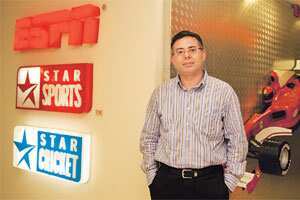 “BCCI should tie up with ESPN sports to be successful. We have brand equity. People recognize us." Sawhney cited ESPN’s success in nurturing the Premier Hockey League and said future relationships between cricket leagues and bodies with broadcasters should be modelled on relationships between broadcasters and leagues such as the US’ National Basketball Association and National Football League. Sawhney joined ESPN Star Sports in 1996 as marketing manager and was promoted to managing director of ESPN Software India Pvt. Ltd in 1999. He moved to the network’s headquarters in Singapore in 2003 as senior vice-president of programming and event management, and was promoted to executive vice-president of programming and marketing in 2005.